This summer, I wrote two stories – the first with Utah State University’s Terry Messmer, and the second with Utah rancher Jay Tanner – which detailed efforts in Utah to conserve the greater sage-grouse, the largest grouse in North America and a candidate for protection under the Endangered Species Act. A decision by the U.S. Fish & Wildlife Service (USFWS) to list the species is due by September, 2015. But there is another North American grouse for which a similar decision is due much sooner. Just two weeks from today the USFWS will determine whether or not the Gunnison sage-grouse will be listed as an endangered species. About one-third smaller than the greater sage-grouse, the Gunnison sage-grouse inhabits portions of South-west Colorado and South-east Utah, with the largest population in the Gunnison Basin. As such, I decided to contact Gunnison County Wildlife Conservation Coordinator Jim Cochran to find out what they were doing to conserve the grouse. The presence of Cochran alone speaks to the seriousness of Gunnison County’s efforts to conserve Gunnison sage-grouse: no other county in the country has a wildlife biologist on staff full-time. 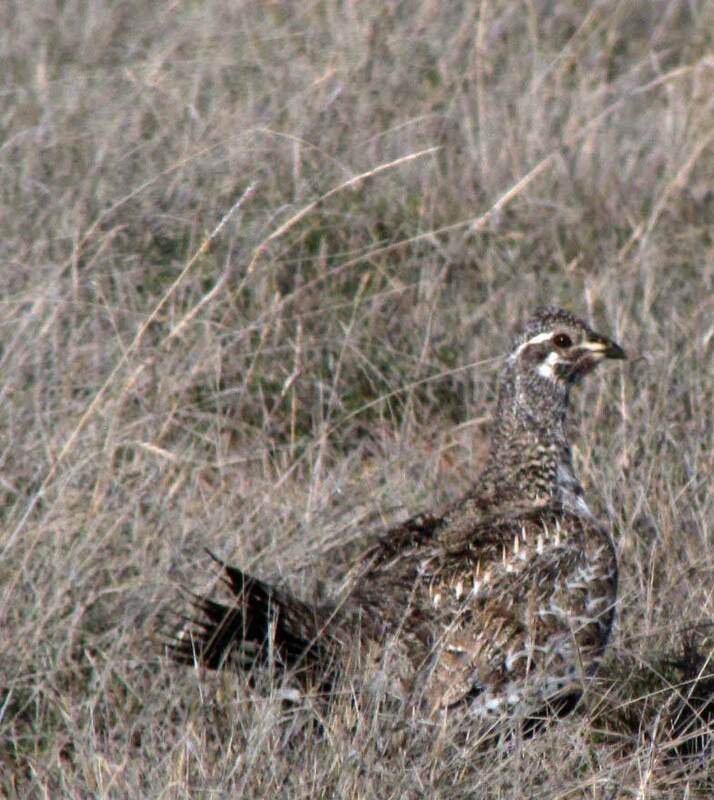 Image: A female Gunnison sage-grouse near Monticello, San Juan County, UT. Photo credit: Bryant Olsen. Probably the county most dedicated to species conservation in the country, Gunnison’s efforts started with the creation of a Local Working Group to address concerns about the future of the Gunnison sage-grouse, and the completion of the Gunnison Sage-Grouse Conservation Plan in 1997. At the behest of the local ranching community, efforts ramped-up in 2005 with the creation of the Gunnison Basin Sage-Grouse Strategic Committee, and the hiring of Cochran, a former USFWS wildlife biologist. He works to coordinate with the Committee, Board of County Commissioners, federal and state agencies and private landowners, and to administer the Gunnison Sage-Grouse Conservation Action Plan, produced in 2009. The county has “literally and figuratively gotten down in the weeds” to develop land use regulations for the protection of Gunnison sage-grouse and other wildlife, with the ultimate goal of precluding the need to list the grouse as threatened or endangered, said Cochran. Looking up the county regulations, I was shocked by their specificity. Among many, these include the “required prohibiting, or requiring control by kenneling or other physically-secure methods” of dogs and cats “within or near a 0.60 mile radius of a Gunnison Sage-grouse lek or within or near sensitive Gunnison Sage-grouse habitat,” minimization of domestic noise and light pollution, and a six-step regulatory guide to the construction of non-agricultural fences. Candidate Conservation Agreements with Assurances (CCAAs), a voluntary program “to maintain or improve habitat for Candidate species like the Gunnison sage-grouse, while also providing landowners with assurances that no further actions (beyond those listed in the agreement) would be required on the part of the landowner to protect Gunnison sage-grouse should this species be designated as threatened or endangered under the Endangered Species Act in the future,” and conservation easements, the majority of which have detailed conservation measures specific to Gunnison sage-grouse under Colorado Parks and Wildlife’s “incentive-based and voluntary partnership program that utilizes property-specific conservation easements and management plans to achieve strategic conservation outcomes,” the Colorado Wildlife Habitat Protection Program. Cochran and others in the Gunnison sage-grouse region believe that these efforts, as well as work to control invasive plant life such as junipers and cheat grass, and the very low risk of wildfire, both of which the USFWS declared threats to Gunnison sage-grouse, have created conditions that support a healthy population not warranting a threatened or endangered listing. Recent independent population viability analyses concluded that the risk of extinction within the Gunnison basin was less than 1 percent in the next 50 years, and less than five percent across the species’ entire range. In two weeks we will see if USFWS agree. Whatever they decide, USFWS is in the unenviable position of almost certainly being sued by someone. According to Cochran, “the Governor of the State of Colorado has said that if the species is listed as threatened or endangered, he will sue.” The Gunnison County Commissioners, and even some of the smaller counties, have agreed to join a suit. And if the species isn’t listed, or is listed as just threatened instead of endangered, environmental groups such as the Center for Biological Diversity and Defenders of Wildlife will likely sue. Such is the world we live in; national organizations focus on litigation; local people living on the land focus on species recovery and stewardship.